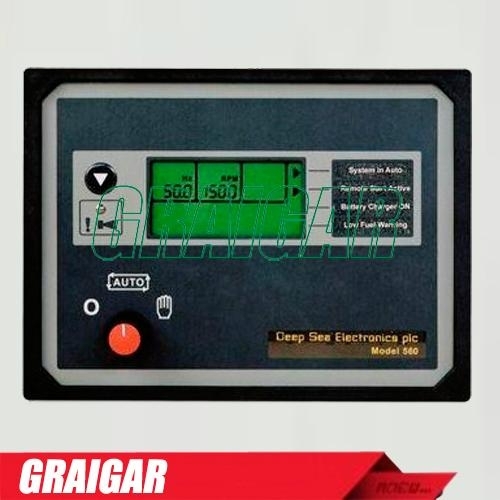 The Model 560 is an Automatic Engine Control Module. The module is used to automatically start and stop the engine and indicate operational status and fault conditions. It will automatically shut down the engine and indicate the engine failure by means of a graphical LCD display and a flashing LED on the front panel. Operation of the module is via a threeposition, rotary switch (key-switch option available) mounted on the front panel with STOP, AUTO and MANUAL positions. The module features microprocessor control and provides a comprehensive list of timers and pre-configured sequences. This allows complex specifications to be realised. Selected operational sequences, timers and alarms can be altered by the customer. Configuration changes to the system are made by using the 808 interface and a PC. This interface also provides real time diagnostic facilities. 8 to 35 V Continuous. Able to survive 0 V for 50 mS, providing supply was at least 10 V before dropout and supply recovers to 5V. This is achieved without the need for internal batteries. 220mA at 12 V. 120mA at 24 V.
10,000 Hz (max) at rated engine speed. 16 Amp DC at supply voltage. 5 Amp DC at supply voltage.